is an Indian spice blend similar to curry powder. Like curry powder, it usually includes turmeric, cumin, coriander and curry leaf. But unlike curry powder, it also includes ground shallots and occasionally several other aromatics. The shallots are definitely a French contribution—vadouvan comes from the Pondicherry region of Southern India, a former French colony. French culinary influence survives in the region to this day. 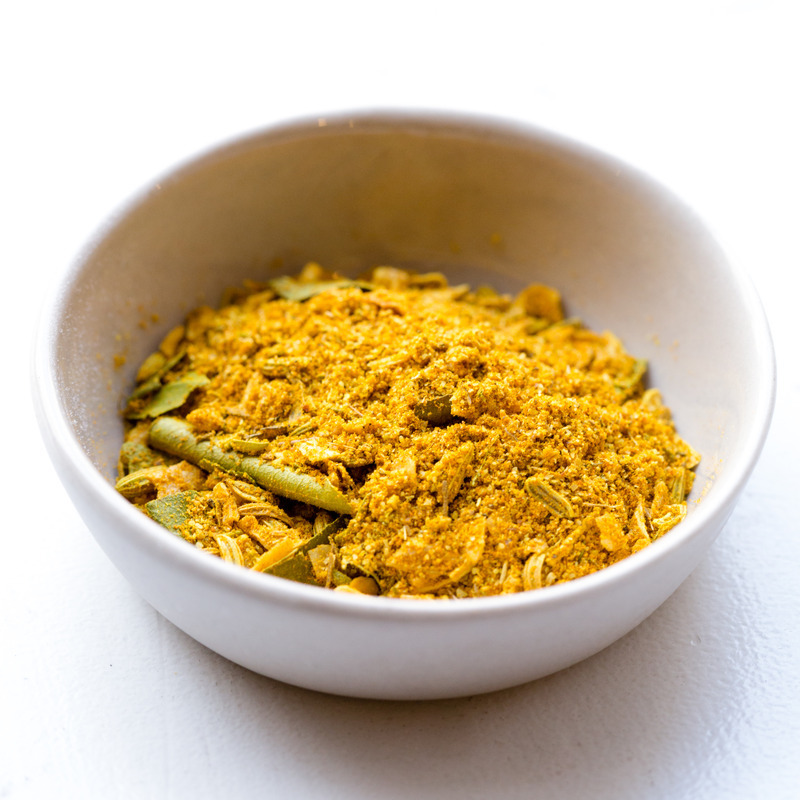 Basically, it can be a blend of up to 30 spices, and just as curry powders vary from one cook to the next, so does vadouvan. Sometimes it’s more of a paste, made with cooked onions, that needs to be stored in the refrigerator. You can also purchase it as a dry spice mix, containing curry, curry leaves, white and toasted onion and garlic powders, brown mustard seeds, shallots and kosher salt. Some blends also include fenugreek and cardamom. Use it as you would a sweet curry powder; the flavor is milder and a bit more fruity, with just a hint of smoke, adding a smoky flavor to vegetables, meats and fish. There are many versions of vadouvan, but I really liked the one created by Chef Inaki Aizpitarte, of Le Chateaubriand, which is roasted for an exotic meatiness. You can definitely make one big batch and keep it in the freezer for weeks— And I am pretty sure that will be tossing it into all kinds of dishes. This Spring and beyond the other seasons as well. Preheat oven to 350ºF with rack placed in the center of the oven. Pulse onions in 3 batches in a food processor until very coarsely chopped, transferring to a bowl. Repeat with the shallots, then the garlic. Heat oil in a deep 12-inch heavy nonstick skillet over high heat until it shimmers, then sauté onions, shallots, and garlic (stir often) until golden and browned in spots, 25 to 30 minutes. Grind fenugreek seeds in grinder or with mortar and pestle. Add to onion mixture along with remaining ingredients, 1 tablespoon of salt, and 1 teaspoon pepper and stir until combined. Transfer to a parchment-paper-lined large 4-sided sheet pan and spread as thinly and evenly as possible. Bake, stirring occasionally with a skewer to separate onions, until well browned and barely moist, 1 to 1 1/4 hours. Vadouvan keeps in the refrigerator 1 month (cool before covering) or in the freezer 6 months. This entry was posted in Spices, Vegetables and tagged Curry, French, Indian, Spice, Vadouvan. Bookmark the permalink.